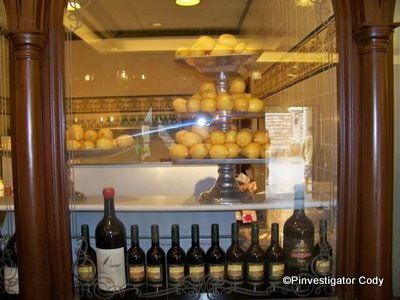 Pinvestigator Cody, who writes the Global Disney Pinvestigation blog, has graced us again with another round of incredible food photos and a great restaurant review. 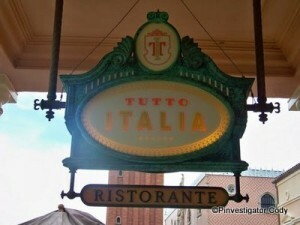 This time, we get insight into lunch at Tutto Italia, the restaurant that recently replaced Alfredo’s in Epcot’s Italy pavilion. Thanks again, Pinvestigator! Arriving at the quaint little Italian restaurant in the back of the pavilion I was a bit nervous…for many reasons. One: I am very picky about my Italian food, because I’m not a HUGE fan of tomatoes. (I was worried, along with my mother, that there were going to be giant chunks of tomatoes in the sauce.) 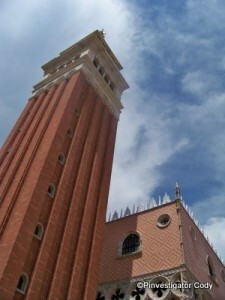 And two: I’ve heard mixed reviews in general of the Italy pavilion food, about both the previous and this restaurant. But I was pleasantly surprised. We were right on time, arriving at Tutto Italia at 3:10 with a 3:15 ADR. We checked in and sat down right away. The waiting room was not full, but the seating area (dining area) was! Lunch was ending at 3:30, and dinner beginning 4:00. After being seated, we had to wait a bit for our waiter. 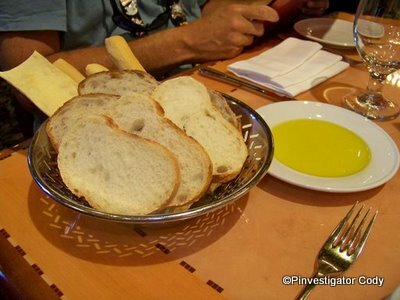 While we were waiting, the host brought us a basket of bread and a plate of oil, which he poured for us right there. 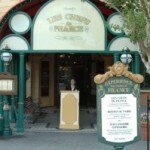 There were two types of white bread, several HARD breadsticks, and a curved, cracker-like bread. We enjoyed them all. The oil was very spicy! It looked normal, so I drenched my bread in it and took a huge bite. (This was BEFORE our waiter came and took our drink order!) The oil was fine at first, then hit the back of my throat with the spiciness. It was OK, just surprising. The waiter came to take our orders, and within about 15 minutes our food arrived. I got the Lasagna al Forno, which had meat ragu, bechamel, and parmesan. It was delicious…and BIG — about 5in by 5in square in the dish. And although I was skeptical about the sauce (as I mentioned before) the tomatoes were small, and I could hardly taste or feel them. The dish was SOOOO cheesy and surprisingly really good. My dad had a Bucatini Gratinati dish with Italian prosciutto, peas, and parmesan cheese. He really will eat anything, but he really liked it. But the real deal breaker on whether we would ever come back is my mother. She just got Spaghetti with Veal Meatballs and Pomodoro Sauce. It came in a BIG dish with about six, one-inch round meatballs. She liked it, and felt the same about the sauce as I did. So overall, the meal was good. As I sat in the restaurant during lunch, I saw MANY different desserts pass by. 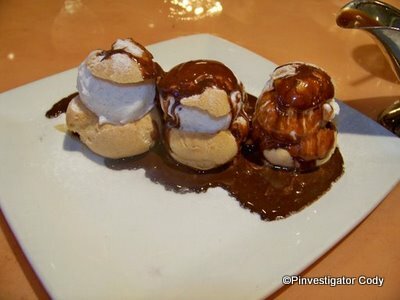 I got the Profiteroles, which were puff pastry with vanilla gelato and hot chocolate syrup. It arrived quickly with two CMs; one gave me the dish, then the other poured the GRAVY BOAT full of chocolate syrup on the three profiteroles. 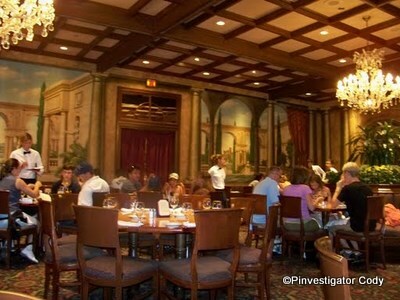 While I’m not a very adventurous eater, I definitely would go back…but Tutto Italia is NO Le Cellier! Thanks, Cody! 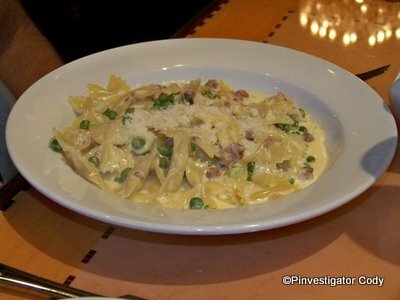 Click here to see our review of Carnivale at Tutto Italia! We love Tutto that we’re going for both lunch and dinner in September. Definitely the best Italian you’ll find on the property. 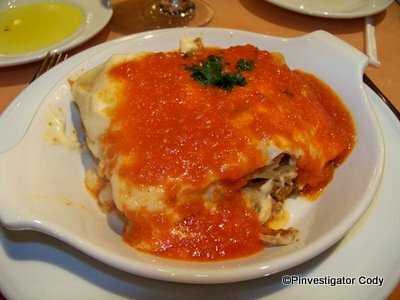 We’re VERY picky Italian foodies since we’re Sicilian but Tutto is delicious every time! I am glad to have found your blog. We are a Disney family and love trying to decide on where to eat each time we go. We ate at Tutto last September and thought it was very good. We are not going back this year because we are trying two other Italian places during our trip, Tony’s and Mama Melrose. 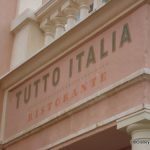 Two Italian meals was enough for us this year, but we really did enjoy our meal at Tutto last year. 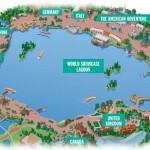 Thanks for the great blog! @Zanna — Thanks for your comment! You get yummy Italian food all the time at home? Lucky duck! @Christi — I’m so glad you found us, too! 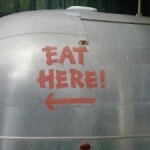 I’ll have to go check out your site! Please let us know how you like Tony’s and Mama Melrose; we’re going to Tony’s on our next trip and will try to get a seat on the patio for the parade! Restaurant was great! 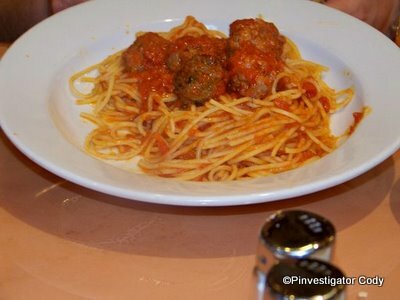 Loved the spaghetti and meatballs in pomodoro sauce, I thought the sauce was excellent, wish I new what canned tomatoes they used; I loved it, unfortunately was to full to sample their desserts which looked absolutely heavenly. Would go there again and again! I definitely will be back!! !